It is no surprise that organic site visitor trends are showing that site entry via mobile devices has been well on the rise over the past few years. Many of us see these mobile search share reports and understand that mobile definitely has to be a part of our overall SEO strategy. If those reports don’t convince you, take a look at your “By Device Category” breakout in Google Analytics to better understand how frequently your site users are entering via a mobile device. Being privy to several Google Analytics accounts within the last few years, I see sites showing that between 15 and 40 percent of all site organic traffic is entering the site either through the mobile device category or via tablet devices. From a usability standpoint, we have to understand that mobile often provides a much different experience to our end users. What has peaked my interest recently is how much Google has been seeming to point to paying attention to your mobile SEO and usability. As I have said a hundred times, if Google provides you with segmented data or a tool offering, there is considerable weighting being given to this. What Tools Has Google Given Us for Mobile SEO? This handy tool takes some of the above Insights tools and, pairing usability and mobile SEO, Google takes it a step further and provides insight on correcting these issues, whether you are the webmaster or someone else has built your site for you. Additionally, within the Google Mobile Guide where the Mobile-Friendly Test resides, Google also provides a Mobile SEO guide to adhere to. To this point we have reviewed a few offerings from Google to help us understand what mobile SEO and usability issues we may be unknowingly executing. Taking the next step in our mobile considerations we must understand that these tools may show the apparent issues, but are these issues a problem across the entire site? You can see that this provides much the same data of the previous tools but allows us to pinpoint where the issues reside. Working to make your site mobile-friendly can help your user experience, your ability to rank, and now, as Bill Hartzer pointed out very recently, Google is displaying “mobile-friendly” tags. To me, this is kind of akin to Schema usage. Google wants to see us format content in Schema format so that they better understand pages, in return granting us rich snippets in search results. Now we can see that Google is giving a lot of love to educating webmasters on the mobile experience as well as what SEO factors can have an effect on your site displaying in mobile search. Hopefully, this is a “refresher” for the advanced online marketer, but for many I assume this is a new territory and you need to understand where to start your mobile optimization. Step 1. What Mobile Framework Are You Employing? Dedicated Mobile Site: Mobile visitors are driven to mobile-specific URLs configured for a mobile display often carrying differentiated navigation and content aside from the standard website. Dynamic Serving: Depending on the incoming device user agent, the rendering display is altered to appropriately fit the user’s screen. Responsive Design: A mobile user is taken to the same URL as a desktop user but the display is conformed to a single column scroll for the user to view the display without “pinching” around. Step 2. Am I Making These Simple Mistakes? Not including canonical tag reference from the mobile page to the respective desktop/standard page and likewise a rel=alternate tag from the desktop/standard page to the mobile page version. Robots.txt exclusion of the mobile page versions if the mobile site resides in a site folder, ex. /m/. HTTP Vary caching is not working effectively due to use of certain content delivery networks. Not including multiple user-agent strings as well as updating these as new devices become available. 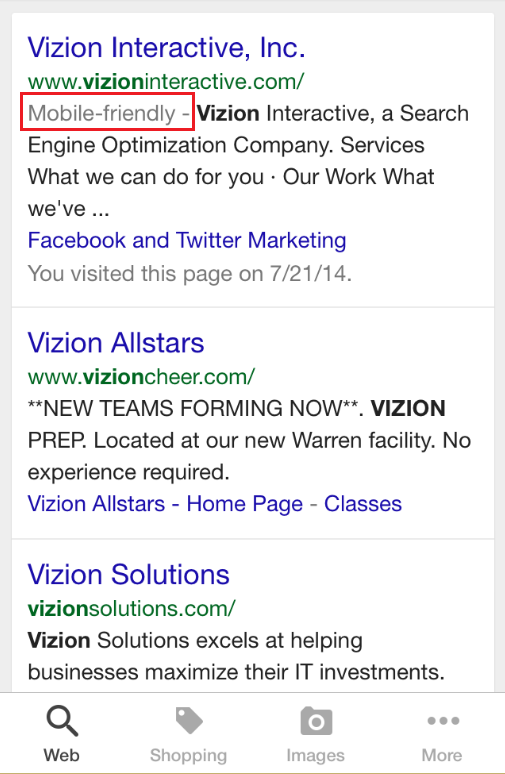 Not reviewing the mobile display to understand where site calls to action(forms, links, etc.) may reside. Often they can be pushed several scrolls down the page. Having content on site that does not play on certain devices, i.e., Flash. While I know there are more mistakes you can make within the realm of mobile SEO and mobile usability, these are the most common I encounter. Understanding first your setup and then second the avoidance of common mistakes propels you further into mobile success so that you can often stay abreast of your “mobile-friendliness” with the above reviewed tools.